The Snooze Button Generation 2019: Ivey makes WSOP final table: How did I miss this? Because I had a journalistic career that often forced me to write about celebrities and athletes, I never am too excited or nervous to meet celebrities. When someone says something like, "Guess who was on my airplane?" Well, that doesn't interest or impress me. With that said, I do have a handful of celebrity stories that do not involve basketball players (I covered the NBA for seven years). Of those stories, the best two are probably the ones in which I was confronted and called out. That happened with Meat Loaf and Martina Navratilova. No joke. Navratilova, in particular, was pissed. 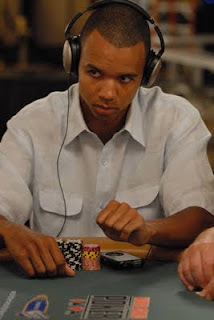 Anyway, I did once meet a celebrity that interested me, and that was poker pro Phil Ivey, the Tiger Woods of poker. He is friends with Mike Dunleavy, the coach of the team I used to cover, and Ivey came to a couple basketball games. My brief conversations with Ivey were uneventful. But I am into poker, so I was all smiles when I shook his hand and introduced myself. In my unofficial rankings of poker pros, I place Ivey second in popularity behind goofy Phil Hellmuth. TV poker viewers might argue that Doyle Brunson, Daniel Negreanu, Phil Laak (the Unabomber) or their own personal favorite is the second most popular pro. But I don't think so. It's Ivey. Ivey is of note now because he made the final table at this year's World Series of Poker main event. That is extremely hard to do because there were 6494 entrants this year, and to be one of the final nine players takes more than just skill and a Full Tilt jersey. Ivey's presence at the final table surely will lift ESPN's ratings for the "November Nine," which reconvenes Nov. 7. My feeling is that poker remains uber-popular, but its popularity peaked in 2006 when there were a record 8773 players at the WSOP main event. Ivey and other card celebrities could give poker's popularity another push this year. By the way, the only other big-time poker celebrity to make it far in this year's main event was Antonio Esfandiari, the magician. He finished 24th and won $350,000. Ivey is assured $1.25 million at the final table, and the winner will get $8.5 million.